Visit the Beegeek Store. Are you a beekeeper or know one? Beegeek designed merchandise makes unique gifts for beekeepers and everyone who loves honey and honeybees. For terrific beekeeping and honeybee themed t-shirts, mugs, hats, bags and other great stuff including several new designs: Beek, Eat Raw Honey, Bee Happy, Beegeek Sticker Store and Give Bees a Chance. And, some that you can personalize. All these designs are exclusively available from Beegeek. And, you can have your beekeeper gift or treat shipped not just to the US and Canada, but also the UK, Germany, Australia, New Zeland or worldwide in time for Xmas. Check back often for new designs. We're designers. We can't stop. One of the problems that all beekeepers have to deal with is crystallized honey. Depending on specific sugar balance of your nectar source, honey can sugar in a few days as in case of raspberry honey or never as in white tupelo honey. So, inevitably we are faced with having to warm their honey to de-crystallize it. A number of beekeepers convert old refrigerators. For a lot of us that solution doesn't work. I developed a new warmer and wrote an article for the August issue of Bee Culture Magazine on how to make a really good one out of a cooler. Though the article is pretty complete and should have enough information to construct one for yourself, I thought it might be helpful to have some dimensioned drawings of the base to help in the construction. To download the original article and helpful detailed drawings, just click here. Read the blog page about the note on using alternate tile sizes. For additional photos to help you construct a heater of your own click here. And, here's a new post I've made for locating the right cooler to convert into a honey heater. I built a group of heaters for my local beekeeping association. Because I was able to get extras of the hard to find Igloo cooler, I built two additional completed honey warmers and I've got one left. It features all of the details of the heater shown in the above plans. The cost of materials was about $195, but I'll sell these completed, tested warmers ready to go for $225 each. Local pickup in the Seattle area only. Sorry, but no shipping. Somehow swarms are always a distance away from a power source. 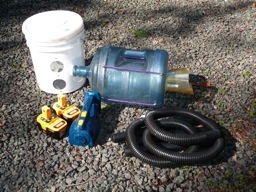 The solution: a battery powered bee vacuum made up from a rechargeable battery powered portable vacuum cleaner and a 5 gallon water bottle. It has worked very well for me for several years. Why not build one yourself? To get the PDF drawings, just click here. In our quest to deal with mites and other issues, I ran across this German plan for deep screened bottomed boards. Yes, the plan is in German but the plans are pretty complete and it should be possible to figure out the critical dimensions. Or you can you use Google to translate the details for additional help. To get the PDF drawings, just click here. I keep looking for new plans to help with Integrated Pest Management (IPM) and rad across these excellent plans. To get the PDF drawings, just click here.